Vacation is a time for relaxing, eating good food, and lounging by the pool. If you’re anything like me, of course, it’s also a great time to reconnect with yourself and do some yoga! When I first got there, it was a 3 ½ hour drive from the airport to the hotel. The drive was so beautiful that the time flew by! Walking into the resort we were immediately greeted with friendly faces, fresh juice, and breath taking views. Once settled into our rooms the serenity of the jungle and peaceful silence (except for the occasional monkey or beautiful tropical bird) set in, and I was hooked. If you stood still for long enough on the edges of the resort you could even see and interact with the local wildlife, and it was unlike anything I had seen before! Every single aspect of the actual resort was beautiful too. It blended in seamlessly with the wilderness around it and made you feel one with everything around you. My room was absolutley stunning. It had a huge bed, a mini kitchen, big windows and glass doors. There was a huge bath tub and shower and a personal outdoor hot tub that looked out over the whole coast. The resort had a beautiful infinity pool that looked out over the ocean with a swim up bar and jacuzzi. There were hikes, trails and even waterfalls on the property. The infinity pool overlooked breathtaking scenery surrounding the resort. We even got the chance to go explore a bigger waterfall (below) that the property manager took us to (Nauyaca Waterfalls). It was about 40 minutes from the resort. The highlight of the hikes? Beautiful waterfalls along the way, including this one that was covered in moss and hidden in the woods. The staff was incredible in helping us figure out what to with our time there. They even taught us so much about the culture of this amazing country. As a vegan, it’s usually annoying going to new and foreign places because you don’t know if there’s going to be anything that you can eat (that isn’t only fruit for a week straight anyway). Vista Celestial went above and beyond in preparing food that I could eat and that was delicious. Not only that, but they have their own garden! Everything was incredibly fresh and in abundance. They even made me a vegan cake when they found out that I would be celebrating my birthday at the resort, and the staff threw a little party. It was all of these intimate little details that showed they cared. Normally on trips I'm forced to stick mostly to salads as the only vegan option, but this trip the chefs were more than accomidating. But my all-time favorite aspect of the resort was, big surprise, the yoga platform. 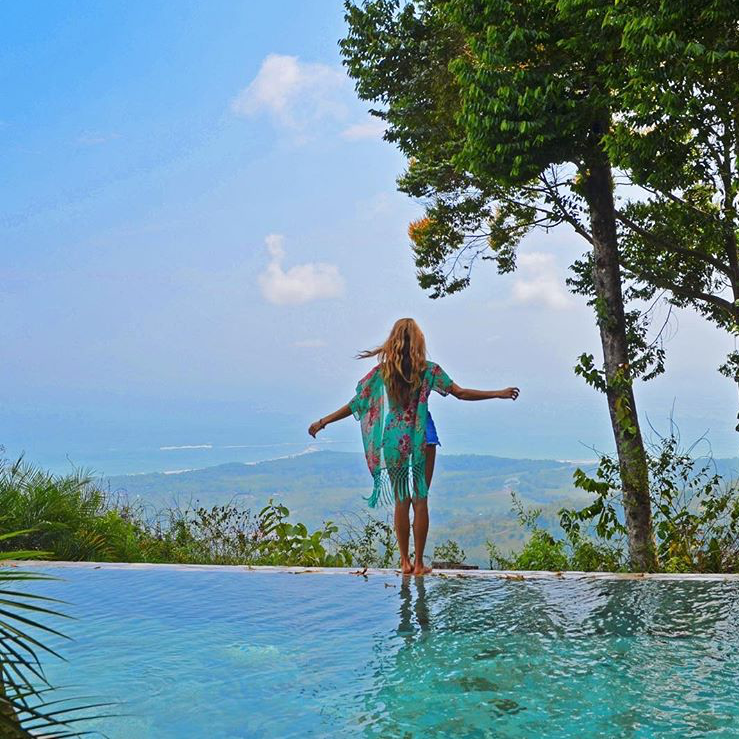 Vista Celestial is well known for hosting amazing yoga retreats. My favorite part was the yoga platform that was surrounded by jungle, and stocked with all the fresh juice you could drink. I spent a few hours everyday getting my yoga on with all the beautiful sound of nature as my music. The yoga platform was one of the most peaceful places I've ever done yoga, and I've practiced a lot of yoga! *P.S. Bring bug spray and watch out for fire ants! How To Eat Vegan On An Airplane! You can eat anything you want! Travelling doesn’t need to be stressful or throw your vegan diet off, just make sure you are prepared and know the rules. I love traveling! I go on about 1-2 international vacations a year and 2-3 shorter domestic vacations…at least! My favorite vacations are always the ones that involve the beach. This time I went to the Riviera Maya in Mexico for 7 days! I stayed at the Catalonia Resort and Spa which was about an hour drive south of Cancun.